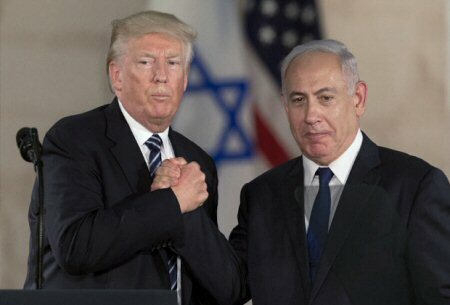 US President Donald Trump, Monday evening, signed a decree recognizing Israel’s sovereignty on the Syrian Golan Heights, occupied by Israel since 1967. This came following a joint press conference with Israeli Prime Minister Benjamin Netanyahu, at the White House, in Washington, DC, WAFA reports. Meanwhile, Russian Foreign Minister Sergey Lavrov reportedly told US Secretary of State Mike Pompeo that Washington’s recognition of Israel’s sovereignty over the occupied Syrian Golan Heights is a violation of international law. Israel occupied the Golan Heights toward the end of the 1967 Six-Day War. Most of the Syrian inhabitants fled the area, in the midst of the conflict. Israel began to settle the region almost immediately after the armistice line was drawn.